Ingredients: strained rose apricots, sugar, lemon-juice concentrate. Gellant: pectin. Farm cook's ham Steiner approx. 400 gr. The farm ham combines in itself the taste and the typical form of the bacon as well as the delicacy and the wholehearted taste of cooked. Honey of very strong and decise scent and aromatic-caramelized flavor. Recommended for smokers, is suitable for the preparation of sweet and sour sauce, goes well with savory cheese of medium seasoning and dishes of seasoned and tender meat. Crystallizes. Elder flowers fruit spread 410 gr. - Beerenhof - Fam. Burger 5,70 EUR / 1,39 €/100 gr. Preserve Strained Apricots 2 kg. - Darbo 14,70 EUR / 7,35 €/kg. Preserve Mixed Fruit 2 kg. - Darbo 14,70 EUR / 7,35 €/kg. Sandy thorn fruit spread 210 gr. - Beerenhof South Tyrol 4,70 EUR / 2,24 €/100 gr. Preserve Raspberry 2 kg. 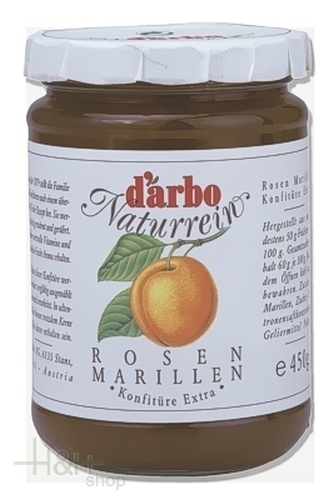 - Darbo 14,70 EUR / 7,35 €/kg.